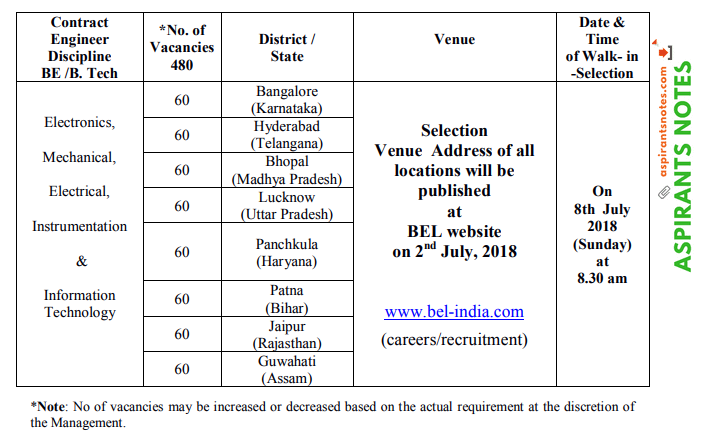 Bharat Electronics, India’s premier Navaratna Defence Electronics Company requires 480 Contract Engineers to be posted across India on Contract basis for FLC of EVM & VVPAT projects for Elections of 2019 (Loksabha/State Assembly) for a period of ONE YEAR, in Marketing & Customer Support Division of Export Manufacturing SBU. Age: 26 Yrs and less as on 01.06.2018. Qualification: First class for General & OBC Candidates and Pass Class for SC/ST/PWD (Person with Disability) candidates in BE / B.Tech from a AICTE recognized University/ institution.